Since my Mum recently inherited my usual hand cream (a mini tube of Neutrogena Norweigan Formula) I took that as an oppurtunity to look around for an alternative budget product. While the Norweigan Formula tube isn't exactly the priciest product at £1.32 for 15mls I wondered if I could find a product I liked slightly better at an equally dinky price! The problem I found with the Neutrogena product was that as the cream is so concentrated, it's actually closer to a thick gel as you can see above. Sometimes I find that although the product is effective the consistency what I wondered about. By the time I've started to rub it in, I find that my hands have already absorbed most of it! Although this absorbency is overall a positive it means that often I have to reapply a little bit here and a little bit there a few times before my hands have the overall coverage I'd like. 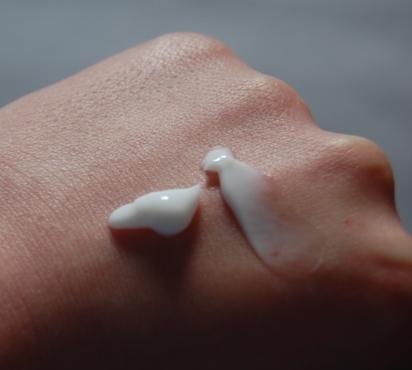 I was interested in trying a cream that is a little bit creamier (without being runny) to see if it could have the same rich moisturising effect. 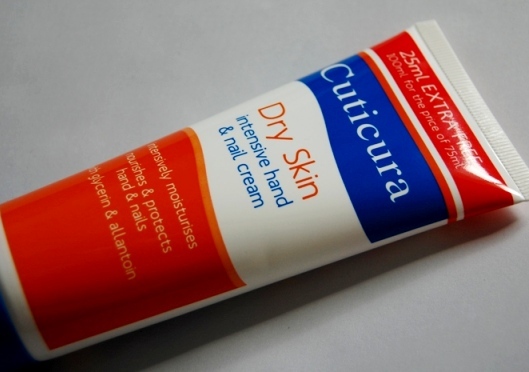 I had heard of Cuticura before so when I saw this cream I thought it might be worth picking up. I found it in a 99p store and thus it was 99p for 100mls! Also on sale in the same shop was a smaller vitamin E rich hand cream by Cuticura. The product itself is creamy and good for budget skincare as it smoothed and soothed the skin on the backs of my hands where I had recently suffered from dry spots. The texture of the product is a rich but light moisturising cream with a bland rather old-fashioned scent. It can leave some slight residue after being rubbed in but no more than other hand products I've tried. I used this product last night and despite washing my hands numerous times since and waiting many hours I still felt that my skin was moisturised in the morning. Below here is a comparative shot of the creamy texture of the product. An unfortunate thing about this product is the fact that I read the label! Although the ingredients in this product seem extremely beneficial to my hands I can't seem to find much information about their policies on testing so I can't recommend it ethically! This was one of a few disappointments with the brand and product. Another dislike of mine is that when comparing the two products the Cuticura cream has about triple the ingredients of the Neutrogena one and yet doesn't seem to be as rich. The other is probably the fact it is scented as Neutrogena actually do offer a non-scented version of their Norweigan formula cream and I don't see how including the bland scent benefits the Cuticura product. Sometimes my sensitive skin really doesn't like perfumes so unless I can justify it as absolutely delicious or barely there, perfume in skincare products can be a no-no. Overall I'd say that this product is alright for 99p at looking after my hands although I really don't think I'll be repurchasing. In the end I think the process of writing this review has made me wonder about swapping hand creams at all! I think I'm still looking for a new rich hand product to be loyal to but I don't think I've found it in Cuticura's offering. I have in the past tried a far better cheap hand cream so I'll just have to do a little detective work to see if I can find out what brand that sample was from! To be honest, it's better spending a little bit more to get good quality products :) However you can find some bargains if you shop around! @Rosh I know! I always make sure I'm buying the right moisturiser for my face so I guess I shouldn't really scrimp on my hands. I guess I just thought it might be worth it because I'd heard of the brand. I'm just hooked on the idea of maybe getting a real bargain! intensive hand cream Visit eantiagingcream.com for best hand cream for dry hands & intensive hand cream- hand creams. Several purchase ready options of Anti-Aging Creams, Anti-Wrinkle Creams.